The image you see to the left is the area of town I live in. The red highlighted area is my precinct. You can see a full map of all the Memphis City Council districts here. 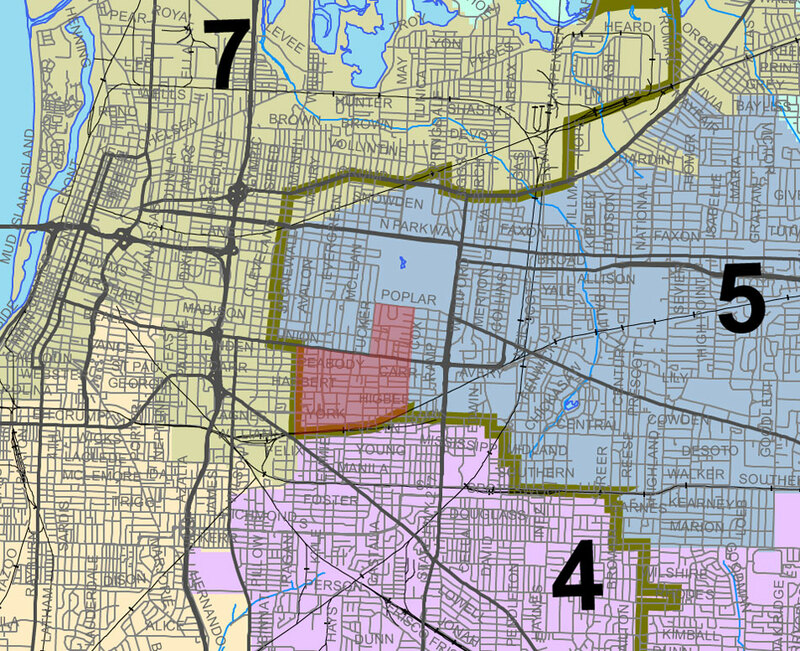 If you click on the image, you can clearly see that my precinct is in Council district 5 and super district 9, but borders Council districts 4 and 7, as well as super district 8. This means, depending on how the population has shifted since the last redistricting ordinance my precinct could end up in any of those three single member districts and either of the two super districts. As I noted yesterday, Nashville’s redistricting ordinance has been in effect since April 13, or starting 16 days ago. Their municipal election is set to be held on August 4th, with a withdrawal date of July 5th, giving potential candidates plenty of time to organize before the final date to pull out of the race. Memphis municipal elections are scheduled for October 6th, with a withdrawal date of July 21. While our election is two months later, our withdrawal date is just two weeks after Nashville’s, creating the potential for significant difficulties for candidates who would challenge incumbents. As of yet, there has been no plan shown to the public, nor any real public comment from the Memphis City Council regarding its plans to redistrict, aside from a deferred ordinance that is on third reading. According to the minutes of the April 19th meeting, that issue will be taken up again on May 17th. The data for Shelby County was released on March 16th, meaning that should the issue be taken up on May 17th, right in the midst of difficult budget discussions, it will have been two months since the data was released that any information regarding the new lay of the land is made available. My issue is not the timeframe, but the lack of public information. Certainly, there are difficult decisions to be made and stringent rules that must be followed. The consent decree that governs the drawing of districts in Memphis has very particular guidelines. From my perspective, these rules are one of the most important reasons there must be public scrutiny of the process, never-mind the whole notion of “open government” itself. So yeah, I’m serious about this issue. For me, the issue is less about “why hasn’t this been done” than “why isn’t more information available about this”. Because, aside from an ordinance on third reading, there is nothing. No maps, no information, nothing. And my attempts to find out more about this process have yielded very little concrete information, calling the process into question, which is concerning to a person, like myself, who believes that the public’s trust in government comes not from the officials, but from the easy availability of information. As I noted yesterday, Nashville’s process was open and transparent, netting several different versions of maps until the final product was unanimously approved. That final product includes specific information that any potential candidate can easily access. While I’m sure many in Memphis are tired of being compared to Nashville, this is something that’s really very simple, and should be put in place. But for all I know, it might be. I have no idea. I’ve heard all kinds of things from people about how this goes down, and I don’t know whose information is reliable. And that’s an unfortunate consequence of a process that is likely being done the way its always been done in the past, but no one really knows anything about. Memphis is full of opportunities. I love Memphis. If I didn’t, I would have left years ago. We have many challenges, but we have a lot of potential. To reach that potential, and ultimately address those challenges, we have to do things differently. I think that there’s little disagreement that what we’ve been doing on a whole host of issues, clearly hasn’t been working. And while this is but a small issue in the grand scheme of things, it is an easily resolved example of part of the problem that cripples us in suspicion and divisions that exist to the advantage of a very few people. I think everyone can agree that the status quo is unsustainable. But we’ve trapped ourselves in a feedback loop of the same ideas over and over again seeking a different result. That is the definition of insanity. To break this chain, we have to take steps to change the way we do and think about things. Small steps count in this process of reinvention. Hopefully, opening up this process can be one of those small steps. Prev Y’all Think I’m Joking Huh? Next I Can’t Decide? Can You? I consider myself relatively well informed but, until seeing your tweet this morning, knew nothing of imminent redistricting. geesus, mary and joseph. Thanks for bringing to my attention. By the way, I am in same precinct. I wholeheartedly agree. Small steps can lead to even bigger, reform-minded steps and even leaps. However, ensuring that the redistrciting process is as Transparent and open as possible is critical. As a former candidate to run in District 7 of Tennessee which includes parts of Shelby County, and now, as a National Director of Redistricting Reform with Common Cause in Washington DC, I would urge everyone to get armed with the facts that impact their neighborhood, attend public hearings, even go online and submit alternative Maps. Reading informative Blogs like this are a great start. You can also go to non-partisan sites like ours (Common Cause)and get in the game!